Yesterday, my fellow early morning lap swimmers and I had our end of the summer breakfast which marks the end of another summer season of outdoor swimming. We’ll head indoors for the fall and the winter. I swim three days a week at 6:00 am, it’s a great energetic start to the day. Swimming, like music, has been a constant companion ever since I can remember. I spent many happy summers swimming on the Choteau Swim Team. (I’m first row on the right in the picture above, I think I’m about 8 or 9.) In college, I was a lifeguard and swim instructor and after college, I became a certified diver when I was working on cruise ships in the Caribbean. That seems a lifetime ago! Now, I’m an early morning lap swimmer and swim mom. My daughter, entering high school, just made the Roosevelt High School varsity swim team. Way to go, Ruby! She’s much faster than I ever was! She’s also a water polo player, because these swimmers just can’t get enough time in the water. We should all find something we love and keep doing it, like swimming, like music! Today’s post, an arrangement of REM’s Night Swimming. More swimming love! Here’s the ever inspirational, awesome Michael Phelps in an Under Armour Commercial. After a glorious Seattle summer full of hiking, swimming, time with friends and family, gardening, weekend trips, a week long music residency in Fife, a speaking engagement in Eastern Washington, home improvements and relaxing, it’s time to settle into the rhythm of the fall. The fall rhythm includes balancing family and home responsibilities with a full teaching schedule (32 private students), daily practice, booking concerts and residencies for 2015 and beyond, and mapping out goals for the year. I’ve got performance trips to Mexico and Alaska on the books for 2015, and am working on completing my second recording, Women With a Past, before the end of this year. 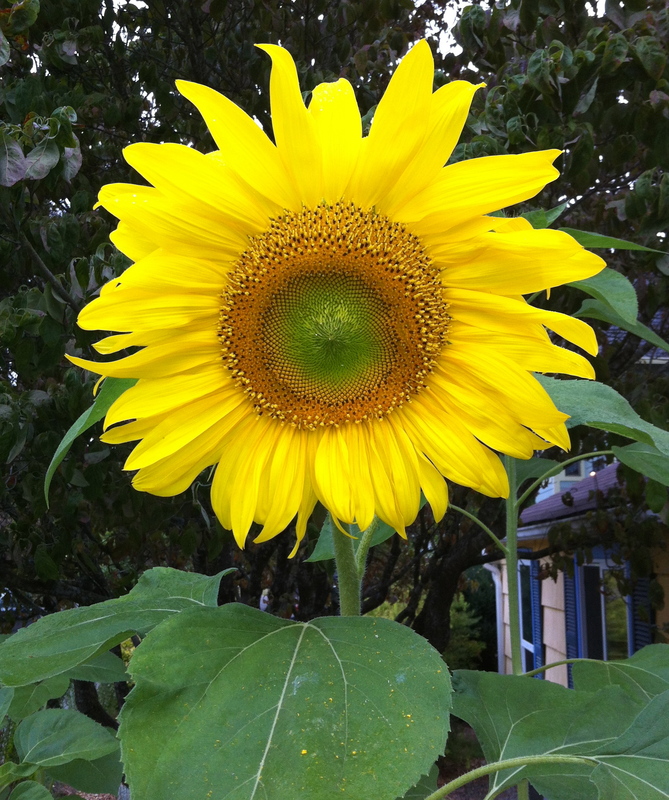 Like this glorious, gigantic sunflower in my front garden, which started from a tiny seed, I’m planning on aiming high and encouraging my students to do the same!